This promo by a Narc That Car member appeared on a .org website that used AMBER Alert's name in its URL. The U.S. Department of Justice, which administers the AMBER Alert program, denied in February that it had any affiliation with Narc. Days later, Narc removed a reference to AMBER Alert in its own video production to advertise the opportunity. The actions of both Narc and its promoters have led to questions about whether the company had come into possession of money based on misrepresentations that caused prospects to believe they were helping out worthwhile causes by joining Narc. The very first Narc promotions observed by the PP Blog were authored by members of AdSurfDaily and Golden Panda Ad Builder, companies implicated in a Ponzi scheme involving tens of millions of dollars. EDITOR’S NOTE: Narc That Car says it is a private company and has no duty to reveal the names of its data clients. This essay challenges Narc’s arguments. UPDATED 4:33 P.M. EDT (U.S.A.) The public has a compelling interest not only in learning the identities of Narc That Car’s clients through appropriate channels, but also in learning the identities of the company’s data-gatherers who may hold jobs in the public sector and are supplementing their income by moonlighting for Narc as consultants. Narc is a highly questionable business. Moonlighting by public employees in highly questionable ways is one of the elements in the Scott Rothstein Ponzi scheme in Florida. Rothstein is alleged to have employed off-duty members of law enforcement as bodyguards while he orchestrated a $1.2 billion fraud. Moonlighting also is an element in a recent case in which investigators in Georgia probed allegations of sexual assault against Pittsburgh Steelers’ quarterback Ben Roethlisberger, who employed off-duty police officers as bodyguards. The assault allegedly took place in the women’s restroom of a nightclub. Roethlisberger was not charged in the case, but was suspended for six games by the NFL for conduct detrimental to society and the league. Two Pennsylvania police officers working for him potentially face disciplinary action for sullying the reputations of their departments and not extricating themselves from a situation in which a crime or crimes might have been committed in their presence. Why Wouldn’t The BBB Have Questions? And why isn’t the company stepping forward with answers that enlighten, not deflect or hop-scotch, around key issues? The company should supply the information to the Better Business Bureau and any law-enforcement agency that asks for it. Information Narc provides could be kept private while any investigation ensues and released by the government if it is determined that wrongdoing has occurred. Narc says it is in the business of paying people to record the license-plate numbers of cars for entry in a database that will be used by “lien holders” and companies that repossess automobiles when owners default on loans. Members of Narc say they record plate numbers randomly — in places such as parking lots — on the off-chance the vehicle is or later will become a target of the repo man. Narc’s data-gatherers are required to provide the address at which the plate number was viewed and recorded. Because the location data likely will be stale and the car likely will be moved before it becomes the subject of a repo bid, there are legitimate concerns about the actual usefulness of the data to lien-holders and concerns about whether Narc is just an excuse for a business, not an actual business capable of making profits from retail sales to database clients. There also are significant concerns about privacy, and the propriety, safety and legality of the Narc program. Some Narc members have advertised that they collect “extra” plate numbers and use them as incentives for prospects to qualify for commissions without gathering data themselves, a practice that leads to troubling questions about whether Narc members have provided corrupt data to the company. An unknown number of plate numbers recorded in Narc’s database may be third-party sightings passed along to incoming members who entered bogus addresses at which plates purportedly were sighted — all to qualify for payments. Equally troubling is that Narc, which has to know that some members are providing plate numbers for downline recruits, does not reveal the names of its database clients, saying the information is proprietary. There may be no way for existing Narc clients to know whether the data Narc reportedly is selling has been corrupted by the practices of members so eager to earn money that they’re giving away plate numbers and the recipients of the plate numbers are fabricating addresses at which the plates were spotted. Corrupt data is worthless data. There are reports that Narc can verify the validity of a plate number — but it is inconceivable that Narc has the means to verify that the plate actually was spotted at a specific address. Adding to the ripples of a potentially corrupt data stream is that some Narc members have instructed incoming members in purported “training” videos not to bother noting the address at the time the plate number was sighted. Rather, the prospects have been told to go home and look up the address on the Internet or refer to a store receipt if they happened to be shopping at, say, Walmart or Giant Eagle, when they were doing their side business for Narc. These practices introduce not only the potential for abuse, but also an undeniable element of “wink-nod” into the business proposition. Gather extra numbers. Give them away. It doesn’t really matter if the car was parked there or not. Any address will suffice. Just get an address off the Internet. Members appear to be able to enter any address they please, whether the car was spotted there or not. Meanwhile, some members have openly said they don’t like their neighbors knowing they’re recording plate numbers for a fee, so they record the numbers in the same fashion a character in a spy novel hides behind a newspaper or makes himself invisible in plain sight. The casualty is transparency at virtually all levels, meaning clients don’t know if they’re buying reliable data, members of the public don’t know if their cars are being watched and if profiles are being created, and Narc members don’t know anything other than the information Narc chooses to share. Narc members say police officers have joined the Narc program as data-gatherers and upline sponsors. If true (and the PP Blog believes that police officers are involved in Narc), it is incumbent upon Narc to publicly identify the police departments for which the officers work. Because of claims made by Narc promoters, the public has the right to determine if officers who belong to Narc are collecting data while on “city time” or during their off-duty hours and assisting Narc in ways that nonpolice members of Narc cannot. Why? Because Narc largely operates in the shadows. Moreover, some of the public claims of its promoters have been beyond reckless — and only Narc knows the truth about how it is paying members and using the data they collect. If Narc has police officers among its ranks amid these circumstances, it means the officers are promoting a business they may know very little about. Police officers should not be promoting a business they know very little about, especially amid these circumstances. That Narc is paying members is not evidence that no wrongdoing is occurring. All successful pyramid and Ponzi schemes pay members. Moreover, the advertising and “training” claims of Narc promoters alone give officers all the information they need to pull out of Narc today and potentially spare themselves and their departments embarrassment later — just as Rothstein’s bodyguards and Roethlisberger’s bodyguards should have pulled out. That the officers are repping for Narc and not providing security services is immaterial. Narc emits the same kind of stink. It stinks even if it’s legal. Few people would begrudge a police officer for supplementing his or her income in legitimate fashion — but that is not the issue here. The issue is whether Narc and many of its data-gatherers are legitimate. The Better Business Bureau has expressed concerns that Narc might be a pyramid scheme. Whether Narc is a pyramid scheme is not the only issue, however. This essay points out some of the other issues. Absent full transparency from Narc, no police officer or nonpolice officer gathering data, asking people to send money to Narc and building Narc downlines can determine if they are promoting a scam. There have been reports in recent days that Narc — through its own unfiltered channels — has claimed the reason it does not publish data clients’ names is because such clients got “incessant” calls when it did publish the names. This claim strikes us as the precise kind of dreck that cannot pass the giggle test on Main Street but somehow passes the plausibility test in the most florid hallways of MLM, which much of America and the world already view as a cesspool. Not only is the claim absurd, it also is contrary to promoters’ claims that Narc was employing a revolutionary MLM concept by which members would build the database product first and Narc would sell it to retail customers later. This approach could be illegal if Narc does not have “true” customers (database clients) in sufficient volume to destroy the pyramid concerns. Although some Narc promoters have claimed the company has “investors,” the claim itself only leads to more questions: Who put up the purported investment money if investors actually exist? Narc promoter “Jah” (see below) has been telling prospects for months that Narc reps engage in “No Selling, Trying, Switching, or Using Anything” — in short, Narc’s data-gatherers do not buy the retail database product. Rather, they pay an up-front fee to earn the right to submit plate numbers, become Narc recruiters and have the prospect of earning more money by sponsoring more fee-paying members who pay for the right to submit plate numbers and become recruiters themselves, and Narc sells the database to another set of customers. These claims and similar claims have led to concerns that Narc was operating a pyramid scheme. Such an approach also can be viewed as a Ponzi scheme. Absent continuous membership growth and real profits from sales to retail database customers to support the payments to Narc’s data-gatherers, the business could collapse. A video promotion in February by another Narc member showed a tab labeled “Clients.” The video was recorded inside the member’s Narc back office and appeared on YouTube — after Narc had been operating for months. â€œDonâ€™t worry about that right now,â€ he said of the “Clients” tab. He did not explain why members should not concern themselves about the tab, which led to questions about whether Narc had data clients in sufficient volume to quash concerns that members were getting paid exclusively or almost exclusively with money from other members — not retail sales to database clients. 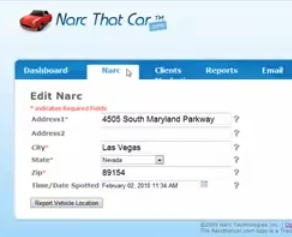 The promo was described as a teaching tool in a YouTube headline titled, â€œNarcThatCar Training Video.â€ In the same video, viewers were told that the parking lots of libraries, schools and universities provided a steady stream of license-plate numbers to be harvested and entered into the Narc database. An address in the video suggests plate data was recorded in or around the University of Nevada, Las Vegas. The address is the same street address as the UNLV campus. Indeed, one Narc promoter after another has pointed one prospect after another to sources of license-plate data, implying that cars parked on both public and private property were fair game for downline commissions. Not even public schools, universities and libraries were off limits in Narc’s universe of members. Narc itself has said its database will be used to locate people, boats, cars and any item imaginable. Data is being mined on both private and public property, and Narc itself says the plate numbers are checked against “the DMV,” commonly known in many U.S. states as the Department of Motor Vehicles. If Narc’s data is checked against the DMV, then Narc’s business is the public’s business. The public has an interest in determining the identities of Narc’s data clients in no small measure because the data potentially could be used to monitor private citizens and people who hold sensitive jobs in government, science, research and the military. Narc’s explanation that its clients’ names are proprietary is unacceptable. Its own members are claiming plate numbers are “public” information and “training” prospects to drive through “university” parking lots and the lots of retail stores and restaurants to get a supply of tags, which are checked against DMV records. If you’re shopping at Walmart, for example, your plate number could be recorded and entered in Narc’s database by a Narc participant in search of MLM commissions and interested in recruiting prospects who could record your plate number elsewhere, leading to even bigger commissions and an even greater loss of your privacy. Incredibly, some Narc promoters have anticipated the public’s objection to such a pursuit, answering it with a chilling argument that people who’ve done nothing wrong have nothing to fear. That is just downright creepy. Is it any of Narc’s business where you park your car because it wants to help the repo man repossess your neighbor’s car? And what if the repo man isn’t Narc’s only client? What if a company poses as a repo company or a “lien holder” company and has an objective totally unrelated to the repossession of collateral? What if a suspicious husband with a violent streak, for example, wants to monitor sightings of his wife’s car? What if a private investigator wants to determine where you spend your time? What if the government wants to determine if you’re seeing a shrink? What if an unfriendly government wants to monitor the whereabouts of an important government official or scientist? Narc’s purported assurance that members don’t record the plate numbers of government vehicles is hollow because government employees own private cars and do not always travel in government vehicles. The sensitivity of their jobs does not vanish if they are in their private cars whether on-duty or off, and the prospect that a data profile on the movement of these cars can be created and offered for sale is unacceptable. It is unacceptable whether the target for monitoring is employed by the government or is just an ordinary citizen employed by any private company. Cars are inexorably linked to their owners. To track the car is to track the owner. Left unchecked, Narc could be used as a data source by private and public entities to monitor people. That is inconsistent with liberty and privacy. It is offensive by its very nature because it potentially puts people who don’t know they are being watched under a microscope, and it is offensive to any notion of propriety because it potentially puts private citizens in the business of spying on other private citizens to qualify for downline commissions. That Narc’s own members are cheerleading for the supposed riches to be made by helping the repo man theoretically get the neighbor’s car causes one to wonder if America is taking leave of its senses and willing to package and sell anything. What’s next? News releases from Narc that announce yet-another successful repo brought about by the company’s army of commission-based spies? MLM has served up a doozy this time: Peel away the hype and Narc emerges as a private spy-agency-in-waiting. At last count, 52,000 people have expressed a willingness to help Narc build the database and share in the joy of knowing they’ve helped the repo man separate a struggling, stay-at-home Mom from the car she shares with her laid-off husband who lost his job when the economy went in the tank. Lien-holders do have the right to seize their collateral if a car owner is in default. Lenders do have a corresponding duty to be responsible to investors and depositors to protect assets. But to create a cheerleading section for the repo man when unemployment is at 10 percent is something only the darkest minds in MLM could serve up. That people seem actually to be comforting themselves with the thought that they’ve performed some sort of civic duty by ratting out their neighbor to the repo man and somehow made America a better place is one of the surest signs yet that a big pocket of U.S. commerce has become morally bankrupt. And that’s before the Narc privacy and security issues are examined in any detail. Does anyone really want Narc to come into possession of data that could be used to create movement profiles on private citizens in any context — all under some implausible theory that the repo man needs extra help? Sensitive research — including research paid for by the government — is performed by some universities. The data could be used to monitor people who hold sensitive jobs. This makes it the public’s business to determine precisely what Narc is doing and how and why it is doing it. Even dispossessing your cash-strapped neighbor of his car, apparently, is funny as long as it pays a downline commission. The email reminded us of the now-defunct Surf’s Up forum, which promoted the now-defunct AdSurfDaily Ponzi scheme by instructing members that “there are no prizes for predicting rain, only for building arks.” Perhaps finding the fuel they needed in Surf’s Up’s trite prose, many members of ASD pressed forward, introducing prospects susceptible to the harmful power of trite prose to one Ponzi scheme after another. As we proceed in this essay, we ask readers to note that check-waving videos and “earnings” reports produced by some members of MLM programs are not evidence of success or honesty. It often is the case in the MLM sphere that promoters who throw caution to the wind and pitch programs they know little or nothing about end up the biggest winners, with the vast majority of participants breaking even or losing both money and time that could be better spent trying to make ends meet by other means. Moreover, it often is the case that willfull blindness and forced ignorance are the dominant traits displayed by promoters. Incongruously, a lack of knowledge about companies and products is what often drives MLM profits. Practiced hucksters often prefer ignorance themselves, while also preferring prospects who will not ask hard questions and are willing to pass along hype and unchecked information as though they were the high gospel of truth. Although Narc That Car provided the identity of a single, purportedly “major” client to the Better Business Bureau April 27, the BBB now says “the client’s identity only raises more concerns” about the company. The BBB did not disclose the name of the Narc client or reveal why its doubts were heightened after Narc provided the information. On its website, however, the organization said it is “communicating” its concerns about the client to Narc. The BBB also noted its inquiry into Narc advertising claims remains open. The advertising inquiry began Jan. 18. It has been unresolved for nearly four months. On March 3, the BBB noted, the organization asked Narc to provide a “comprehensive” list of clients. Narc responded April 27 by providing the name of “one of its major clients,” a development that not only did not dampen the BBB’s concerns that Narc was using a pyramid business model and did not have a product with true value, but also ramped them up. Narc That Car has identified Rene Couch as its vice president of marketing. He also has been listed by titles such as executive vice president and chief field advisor, leading to questions about whether Narc and its promoters were making things up as they went along. Narc already has an “F” rating from the BBB, the lowest score on the organization’s 14-point scale. In the past two weeks, at least two television stations in major markets in the United States have aired reports about Narc, questioning Narc’s business practices, the level of knowledge Narc’s promoters have about the Dallas-based company and Narc’s willingness to address the questions in an atmosphere of transparency. Meanwhile, some Narc promoters have been attacking the BBB and accusing the TV stations of biased reporting — instead of insisting that Narc get out in front of the stories and concerns and put the issues to rest. One of the promoters attacking the BBB is Ajamu M. “Jah” Kafele. Kafele once was accused in Ohio of practicing law without a license and ordered to pay a civil penalty of $1,000 by the Ohio Supreme Court after the bar proved its case against him. A. [Kafele]. I donâ€™t recall my age. Next question. Q. [Defense counsel]. What was your date of birth? A. I donâ€™t recall my date of birth. Q. Do you have a driverâ€™s license on you? Q. Do you have any form of identification on you? Q. Do you have parents? Q. Do your parents — are your parents living or deceased? A. I donâ€™t recall. Are you going to ask me some relevant questions to the defense and claims or are you going to find out about my livelihood for your personal gain? Q. — or not you have parents. Do you have siblings? Q. Whatâ€™s your home address? Q. Whatâ€™s your current occupation? A. Who said I had an occupation? Q. Are you gainfully employed? A. Who said I was employed? Q. Iâ€™m asking you a question. A. Iâ€™m asking you, who said I was employed? A. I donâ€™t recall being employed. Three-figure, check-waving YouTube video by "Jah," who publicly announced his downline group was "not going to be out here flashing, you know, five-figure checks.â€ The video, which featured a claim that repping for Narc was like working for the "Census Bureau," later was removed from YouTube's public site. Why it was acceptable to publish a three figure-check but not a five-figure check was never explained. Strikingly, Kafele, who once believed it was prudent to sue lawyers who were trying to collect on a debt, now has thrown in his lot with Narc That Car, which says it wants to help repossession companies collect their collateral when buyers default on loans. The case cited above did not have a happy ending for Kafele: A federal judge tossed the preposterous lawsuit he had brought, saying Kafele had engaged in “egregious” conduct. Kafele now is telling prospects he is an authority on Narc That Car. He said he has hundreds of members in his downline. He has been conducting meetings in Ohio to recruit even more prospects, according to his website. Not a single Narc promoter approached by Fox 5 in Atlanta in a package aired recently could identify a single Narc data client — and yet the promoters were out in force recruiting people for the firm. Meanwhile, Fox 11 in Los Angeles recently visited YouTube and reported on unsubstantiated claims passed long by Narc promoters to a worldwide audience, noting that California Attorney General Jerry Brown was seeking information on the firm. It is known that attorneys general from at least three states — Georgia, California and Texas — are aware of growing doubts about Narc’s business practices. Narc promoter shows prospects that parking lots at the University of Nevada Las Vegas are an excellent source of license-plate data. Narc prospects in this promoter's YouTube video were given no guidance on whether the university or campus police needed to be consulted before recording the plate numbers of students, faculty and employees. The promoter said "libraries" were excellent sources of license-plate data. — as long as commission checks for recruiting members keep streaming in. As things stand, there is no way to determine if Narc is operating legally. The reason there is no way is that Narc does not reveal the names of clients, will not step out of the shadows, put an executive and attorney on TV or consent to a probing interview by a print journalist to answer the doubters and publish verifiable financial data audited by a CPA that shows inputs and outputs and the sources of revenue. Any argument that suggests members are not entitled to this data or that the data is proprietary because Narc is a “private” company is not going to fly. The company’s promoters are saying that license-plate numbers are “public” information available for the harvesting by a membership roster of 52,000 people for the purpose of populating a database that Narc itself has said is going to be used to locate people, cars, boats and any item imaginable. That alone makes it the public’s business. Beyond that, promoters say Narc is using government databases to verify data. The assertion that Narc is using the DMVs of America’s 50 states to verify registration data gives the public a compelling reason to demand answers from the company. Narc has a duty to tell the public through appropriate channels precisely what database it is using to cross-check data entered by members and how it is accessing the database. It also has a duty to reveal the names of its clients, explain how it screens clients, explain how it screens its data-gatherers, explain whether Narc is able to connect a car to a person when members enter license-plate numbers and explain how the data is secured. Absent complete transparency, the privacy of every person whose tag number is entered by a Narc member is a potential casualty. It is inconceivable that Narc is empowering itself to collect your license-plate number — no matter where you park — because it has secret clients in the business of repossessing cars and there is a small chance that you are behind on your car payments or a person you do not even know parks his or her car in the same parking lot as you and is behind on his or her car payments. This is the business Narc has chosen to enter — and the public has a compelling interest in knowing precisely how it operates. Narc exposed its own Atlanta-area members and prospects to embarrassment after a Fox 5 reporter showed up to a pitchfest with a hidden camera and could not get answers even to basic questions, but the company has not issued a statement that addresses the concerns in any real way and is suggesting the media is to blame. No part of the Narc story is consistent with transparency or ordinary business practices — and the media attention likely is only now beginning. Viewers in Atlanta and Los Angeles — two of the largest markets in the United States — now have been treated to an appalling lack of professionalism in the MLM sphere, which only will fuel the public’s legitimate doubts about the industry as a whole. Why wouldn’t the public believe the Internet is just one giant cesspool after viewing the reports on Fox here and here? If you’re a Narc fan and want to argue that Narc was ambushed, you need to know that Narc had plenty of opportunities to answer questions from journalists before they started hiding their cameras. The PP Blog, for instance, has attempted to contact Narc multiple times. The Blog is aware that other news sites have met dead ends in bids to get Narc executives and knowledgeable employees to answer questions, including NBC-5 of Dallas-Fort Worth and others. The Fox 5 Atlanta report neatly exposed promoters’ willingness to cheer for a program, duck responsibility for their claims and then hide behind the skirt of a company when the heat became too intense. The trouble with hiding behind Narc’s skirt, however, was that the skirt provided no cover for members. Promoters found themselves in the awkward position of taking heat for a company that did not defend them in any credible way. Narc’s skirt provided no cover at all, and yet some members merrily continue to promote the opportunity and apparently see no incongruity at all. Let us spell it out: If you’re going to say the media must get answers from the company rather than promoters in the field, you are hiding behind the company’s skirt. And if the company does not provide the answers, you have no cover at all. This creates the appearance that the prospect of making money is the only thing you value. You certainly don’t value transparency if you’re hiding behind the company’s skirt, and the company certainly does not value transparency by ducking questions, avoiding them altogether or spinning things to create the appearance that the media are responsible for Narc’s lack of transparency. Some Narc members made much ado about a TV anchor referring to Narc as a “job,” but dozens of Narc members posted ads on craigslist that advertised Narc as a job. Promos for Narc have been reprehensible. One member claimed Narc would be used to help the Department of Homeland Security find terrorists. Others claimed that the FBI and the AMBER Alert program endorsed Narc. These were blatant misrepresentations — plain and simple. If the MLM world wants the rest of the world to take it seriously, it has to quit serving up this slop and stop apologizing for its chefs and the seemingly mindless cheerleaders who cheer for the chefs even when roaches are swimming in the soup. Now, amid a circumstance in which the BBB — one of America’s most recognized business organizations — has questioned whether the Narc chef is serving up a pyramid scheme that potentially affects tens of thousands of people, the cheerleaders are responding by trying to plant the seed that the BBB has a secret agenda and is infested with roaches. It is reprehensible — and it must not stand. Why are Narc promoters so willing to represent a company they know so little about? Does Narc not understand that vague, ambiguous claims on its own website and its apparent unease in addressing media questions are what’s driving the story? Why has a Narc PR spokesman not emerged to address media inquiries and become the face of the company? Why aren’t Narc executives stepping out in front of the cameras? Why have the statements Narc has issued not explained the incongruity of insisting that license-plate data is “public” information while at once insisting the public has no right to know who its clients are, how they are being screened, how data-gatherers are being screened and how the information is being indexed and sold? Why does Narc insist it has the right to collect your license-plate number and offer it for sale to a third party whose identity and motives are unknown to you? Why do tens of thousands of Americans suddenly seem so willing to waltz through parking lots of major retailers to record the plate numbers of their neighbors and to recruit others to do the same — when they have knowledge in advance that troubling questions are being asked about the firm? Why does the repo man suddenly need the help of a commission-hungry MLM army to dispossess people going through lean times? Any chance that the “buy here, pay here” car business and the title loan business are backing Narc because the industry’s practice of approving anyone for a loan actually is driving repos? Why are prospects so willing to hand over money when neither sponsors nor Narc itself are willing to provide information that could make the concerns go away? How many data clients does Narc have and when did the clients become clients? How much revenue do the data clients generate for Narc weekly and monthly? Is it possible that Narc is selling data to itself through a process in which it formed another company to become a Narc client or is relying on an alter ego of some sort or close association with another firm to create a client out of thin air? Is Narc closely connected to the “buy here, pay here” automobile business, meaning an entity with a close association with Narc is making high-risk, front-loaded, usurious loans to disadvantaged consumers? Is Narc closely connected to the title-loan and payday loan business? Is Narc closely connected to the repossession business? Does Narc have an investment angel? If so, what is the source of the money and was a private offering involved? Is Narc making pyramid or Ponzi-style payments to members? Narc promoter tells prospects the company was started to provide data to the Amber Alert system. Who are Narc’s executives beyond CEO William Forester? What are their names, job descriptions and backgrounds? Do they have high positions in the MLM organization and rely mostly or exclusively on commissions or do they draw a salary? Who are the members of Narc’s board of directors? Are police officers involved in Narc? If so, are they collecting information off-duty or on-duty — and are they complying with the policies of their departments and their cities in their efforts to increase their income? Promoters have claimed that Narc is authorized to verify license-plate data through the DMVs of all 50 states. Is that true? If so, is Narc able to view the names and addresses of vehicle owners and the makes and models of vehicles as police officers could do? If untrue, is Narc verifying the data entered by members through another process — for example, querying databases to determine if a plate number already is “taken” in a state and thus unavailable to any other party, and then concluding the plate is valid simply because it is unavailable to another party? Is is possible that police officers are querying restricted databases on Narc’s behalf? The parking lots of these famous companies are sources of license-plate data for Narc affiliates, according to a promoter. Whether any permission is required of store managers or motorists to record plate numbers for entry in a private, for-profit database is left to the imagination. What part of the approach in the question above is consistent with an attempt to build a valid database, especially if Narc cannot verify that a “gift” plate number actually was viewed in a specific location by the recipient of the gift? Why has Narc not publicly and loudly renounced the practice of providing the “gift” of plate numbers to incoming prospects? Can Narc tell if entire downline groups are simply trading or recycling existing plate numbers among members and instructing members and prospects to fabricate an address where the plate was sighted? How can Narc possibly know if the cars members say were parked at a specific location actually were parked there? What specific event occurred that caused Narc to remove a reference to AMBER Alert in a video promotion and insert the name Code Amber instead? About Data Network Affiliates . . .
Is is possible that DNA saw that Narc’s new business of recruiting members to record license-plate numbers was resonating in the MLM universe? And did DNA then engage in a cynical ploy to build a customer base by incorporating Narc’s message — including references to law enforcement and AMBER Alert — simply because it was “working” for Narc? DNA declares "GAME OVER - WE WIN" repeatedly in a hype-filled email pitch to announce a $10 unlimited cell-phone plan. The company had been in the cell-phone business only days when it claimed to be able to beat virtually every other competitor on earth on cell-phone pricing. Only weeks later DNA claimed it had been hoodwinked into believing it could offer such a price, removing the offer and claiming to be excited about its future. DNA quickly backed away from emphasizing data collection after it observed Narc becoming the focus of critics who raised concerns about the propriety, safety and legality of Narc — and then DNA morphed into a sort of anti-Narc, saying it existed to help law enforcement only and would never share data with repo companies that wanted to take away cars owned by poor people. â€œDNA Affiliates STAY ALERT â€“ They are watching out for their neighbors children. If DNA has 1 million affiliates that is 1,000,000 more people watching out for and caring about children world-wide. â€œOther companies may collect data to sell to REPO COMPANIES to take cars away from many people who are just down on their luck. A single mom, a dad out of work or 100 other good reasons why good people just can not make a payment. One DNA Affiliate just had his car repossessed because he owed 3 payments and offer to pay two of them and they said no and picked up his car. â€œDNA will have no part in such cases. At DNA we collect car data for one purpose and that purpose is that there is a small chance that this data in the right hands could help save a child or help prevent or solve a crime. DNA also positioned itself as the “free” Narc, before springing a $127 upgrade on customers to purchase a data-entry tool that worked faster than the clunker provided the “free” members at no cost. Free members were not told they were getting a clunker until the upgrade program was announced. Before long, DNA announced it was in the cell-phone business — and plenty of other businesses willing to sell products to members who thought they were joining a “free” business. Could DNA’s approach be the most cynical, ribald effort in the entire history of MLM? And does the DNA braintrust not recognize that MLM has so many critics precisely because of the obnoxious and absurd approach of the man behind the green curtain and the men letting him get away with serving up ceaseless, hyperbolic slop? In our view, DNA is the worst example of wretched excess the MLM trade has ever served up — and Narc is close on its heels for enshrinement in the Hall of Shame. To be sure, Narc is not the next Google, DNA is not the next anything — and the industry has demonstrated once again that many, many of its members think that trite talk about arks is the same thing as building one. Excellent commentary as always. Here’s the bottom line between an MLM and an Illegal Pyramid scheme: To be a legal MLM, you must have a product you can sell to people who are not members of the MLM. You must also derive at least 70% of your income from the sale of products, not from recruiting others to join your program. Narc and DNA do not meet either of these criteria’s. For those two reasons alone, they are both Illegal Pyramid Schemes. It is amazing to see the lengths the reps, or execs, for either of these companies will go to deflect any serious questions, or provide any real answers. They can’t, because neither company has any clients who are paying for this so-called database of information they have collected. Not one rep or company representative has been able to produce such a client; it is only claimed as you have pointed out. Even if they could, they still do not have any product the reps are selling to the public that makes them a legitimate MLM. Just don’t expect anyone from Narc, or DNA for that matter, whether a rep or company official to answer any of your questions. The moment they do so, they admit they are an Illegal Pyramid Scheme. Not even if you double-dog dare them. Could DNAâ€™s approach be the most cynical, ribald effort in the entire history of MLM? I’m not sure. There have been claims of MLM snake-oil health drinks curing cancer, AIDS and many other illnesses. I think attempting to profit by selling an overpriced health drink, because someone has a serious illness, is probably worse. I think one of Phill-The-Crime-Wave’s previous enterprises claimed to help with some form of cancer. Tony H: Iâ€™m not sure. There have been claims of MLM snake-oil health drinks curing cancer, AIDS and many other illnesses. I think attempting to profit by selling an overpriced health drink, because someone has a serious illness, is probably worse. I think one of Phill-The-Crime-Waveâ€™s previous enterprises claimed to help with some form of cancer. I get what you mean, Tony. In my view, suggesting that NARC/DNA exist to find abducted children — and actually to create .org domains that imply money sent to Narc is like donating to a charity or supporting the police — is at least the equal of snake-oil cancer cures. I will go so far as to question whether there are only 10 plates total being passed amongst ALL the members and they are entering them at random locations. What proof is there that this isn’t the case? I will say that a plate such as mine or my neighbor’s (whose car just sits in the driveway and does not get used) are corrupt data as there would never be a use for it. We are law abiding citizens and both vehicles are paid for so what good is that information yet someone is going to get paid to enter it? >> Lynn wrote: It is amazing to see the lengths the reps, or execs, for either of these companies will go to deflect any serious questions, or provide any real answers. Isn’t it though? The Fox 5 report, I believe, should become required viewing for people just entering the MLM sphere. Whip: both vehicles are paid for so what good is that information yet someone is going to get paid to enter it? Whip: I will go so far as to question whether there are only 10 plates total being passed amongst ALL the members and they are entering them at random locations. I know you are expressing incredulity here and using language in an ironic sense to make a point — and yet Narc can’t take it off the table. It’s easy to form the view that limiting data-gathering to 10 plates is just a way to create churn. And the mere fact the address data cannot be verified in any real way and that members are using “extra” plate numbers as gifts to incoming recruits exposes serious flaws in the data stream. A plate purportedly sighted in Florida actually could have been sighted elsewhere and given as a “gift.” People behind on their car payments actually could enter false addresses just to throw off the repo man and send him on a wild goose chase. It also would be interesting to know if members are NOT entering their own plate numbers because of their fear of Big Brother — but have no problem entering the plate numbers of neighbors. It also would be interesting to know if one of the unstated aims of Narc is to get members to enter their own plate numbers. You hit the nail on the head, as I was just thinking would they enter their own plate numbers, as well as members of their family and friends?. No need to go plate hunting if they did. Since I have a ton of cousins, many of whom I don’t even know, I could give 50 people their license plate numbers, and still have plenty left over for me to give. Just think, I have 67 first cousins, over 125 second cousins and God knows how many third cousins. Throw in step-cousins and I think I could have well over 400 family members. I could make a fortune from these two programs and never have to leave my family tree to get them. This is how absurd this all is. On second thought maybe I need to join and become really rich overnight! LOL! April 11 story from Waco Tribune-Herald noting, among other things, that police officers are involved in Narc. DNA, once the future of the data-collection industry, now the future of the cell-phone industry in Houston. “. . . new cell phone program being announced on 5/1/2010 . DNA: “best thing since sliced bread” in Amsterdam. Certainly a whole lot of internet pollution going on there. We at CSI would like to introduce our latest major milestone in achieving success for you, your team , and CSI corporate. We are very excited about the future of our organization and the quality of the team we are forming to support you in the field. Todd Wilson joins CSI today, May 19, 2010. See attached short bio. Mr. Wilson is a dynamic, highly motivated sales, marketing and communications professional with a proven record of success in fast paced, highly competitive business environments. Mr. Wilson’s experience includes 10 years in corporate support of network marketing professionals as well as full profit and loss responsibilities for dual location offices for a major franchises operator. We believe Mr. Wilson is a great addition to our growing team here at Corporate and look forward to adding more staff to help better serve our clients and consultants moving forward. This company grew SO FAST that there were growing pains – resulting in Some members not getting their checks; I was recently told, they are going back through their system, and checking to see who is Owed a Check – and will be sending those out soon. If that’s understandable to you, as it is to me, then I highly suggest you take another serious look at this opportunity. Evaluate for your self, if you can do this – Does the compensation plan make sense? Do you think You can make money with this business — or not? Does it matter to you who the Clients are that are buying this information when, most of this information is already accessible via the local DMV? The only thing missing … is a report that you visited the mall, or a local store :: which could be found out anyway. That seems to be where MOST of the controversy lives – whether or not this information is a “product” – and whether or not Clients are buying this information. Do you think people spend money for information? Have YOU ever spent money for information? Growing pains, late payments, checking the system. Yes, this scam is at that stage. The Russian Hackers are warming up their keyboards getting ready in case they are needed. Why should any ‘member’ be excited that yet another leech has been put ahead of them in a money grab position? Tony H, quoting Narc promoter: Does it matter to you who the Clients are that are buying this information when, most of this information is already accessible via the local DMV? It is a plain FACT that a private investigator or a repo man cannot call up the state DMV database and then be presented with “historical location data” of where a car had been parked. If the government ends up taking action for whatever reason, it is possible that privacy groups will file briefs to educate the judge on what’s at stake here beyond the pyramid concerns. Bottom line: To track the car is to track the person. Narc and DNA are tracking people and trying to dress it up as a public service. The quoted material above is the exact kind of semantic deflection that occurred in the ASD case regularly. Narc knows darn well there are serious privacy concerns. Point is, the identities of Narc’s clients SHOULD matter to ALL promoters. First, there is no practical way to tell if Narc is legal (nonpyramid/nonPonzi) without this information being released. Even if it can be determined that Narc is compliant from the pyramid and Ponzi standpoints, other issues of legality, safety and propriety remain on the table. Narc doesn’t even explain how it screens clients and consultants, let alone how it keeps the data secure. The data could be used to monitor the private secretary of the President of the United States or the spouse of the Director of Central Intelligence, putting the security apparatus at risk. And cops are in this thing? Makes me want to hurl. Yes, I know that some folks will dismiss my views on this, claiming I read too many Tom Clancy or Robert Ludlum novels. That’s meaningless to me. Data such as this is dangerous. Companies could start subscribing to the service to monitor employees away from the office — spouses to monitor spouses, criminals to monitor cops, drug dealers to monitor competitors, gangs to monitor rival gangs, opposition researchers to monitor political candidates and their families. The possibilities for abuse and privacy invasions are endless. Tony H, quoting Narc promoter: The only thing missing â€¦ is a report that you visited the mall, or a local store :: which could be found out anyway. Good grief. This, too, is shameless. The mall and the store are described as innocuous in this email. Fact is, they’re not innocuous because the data is being used to monitor the movement of people — and it’s not just a matter of malls and stores. It’s DOCTORS’ offices, PHARMACIES, places of WORSHIP, ATTORNEYS’ offices, state, local and federal offices, your MOTHER’s house, your GIRLFRIEND’s house, the TAVERN, the BOWLING alley, the GOLF COURSE, the LIBRARY, the UNIVERSITY, the HOTEL you’re staying at on vacation, the AIRPORT, the BOOKSTORE, the PHARMACY, the STADIUM, the CASINO. It’s unclear to me whether Narc/DNA has the capacity even to prevent members from entering info for other members — just like ASD couldn’t prevent members from surfing for other members. Entire downline groups could be sharing plate numbers and sharing accounts for the purpose of “beating” the Narc/DNA system to gain an advantage — ie., ensuring that people who plunk down the $100 get $50 and then more back by meeting minimum recruiting numbers. Basically Narc is creating a private spy agency — on U.S. soil. There is nothing wholesome about this. It is invasive, plain and simple, and Stepford Children are doing it for a sort of private BIG BROTHER that provides data for secret clients. P.S. Narc promoters should not believe their uplines if the Google Map service and “shopping cards” rationales get trotted out — ie., that collecting data is nothing new, that Google collects info from public streets and retailers collect info from customers. At least in the case of shopping cards, customers must provide informed consent. They have the option of denying the consent and not using a card that gives a retailer an understanding of what they buy. People on the street have no such option from Narc; there is no informed consent to having a license-plate number recorded and transferred/sold to a third party (Narc), to be transferred/sold again to another third party (Narc’s client). In other words, information about people who don’t know they are being monitored is being sold at least TWICE — first to Narc, and then to the Narc client — and the person being monitored has no say-so in the matter at all and absolutely no knowledge about how the data is being used either by Narc or its client. And what happens if Narc’s client sells the info to yet-another third party or starts building its own database? Notwithstanding the fact that there are legitimate privacy concerns about what Google does and what retailers do, what Narc is doing is even more invasive. Narc is publicly advertising that it has the ability to show various addresses at which a specific car was parked. Some people have claimed a specific order can be placed for a specific tag number — and that bonuses could be awarded to the person who found the car and entered the location data. If Narc can do this for a repo target, then it can do it for ANY target as long as there is an entry or entries in the database. Loansharks could use the data to find out where a customer who’s been avoiding them is hanging his hat. Drug dealers owed money could use it. Hit men could use it. Spy agencies could use it. How does Narc keep those people from becoming clients? Does it screen for things such as criminal records, proper licensing and corporate registration? How about the employees of the clients? Does Narc insist that its clients properly screen their employees who will have access to the data? Although “Jah” says repping for Narc is like working for the Census Bureau, the claim is ridiculous. Moreover, he does not mention that many, many Narc “consultants” likely are entering data by subterfuge because of the purported “training” videos on YouTube by various Narc promoters. Some members have openly said they are not keen on being observed entering plate numbers, so they do stop-and-starts in parking lots so as not to attract attention. Jah said people could enter plate numbers without talking to ANYONE. That is purely clandestine. Purported “training” videos on YouTube actually have encouraged clandestine behavior by Narc/DNA downline members. They want the money, all right; they just don’t want to be observed recording data because its puts them in the position of perhaps having to explain what they’re doing. Fox 5 showed that Narc members aren’t keen on explaining anything. What’s truly odd is that a number of the videos of YouTube show the Narc member’s face — and then the member suggests that people might not want to be seen recording plate numbers. Why not, if it’s so wholesome? Why not proudly waltz through Walmart’s parking lot on private property and tell passersby that you are writing down plate numbers on the theory it helps the Repo Man? Why the need to use any form of subterfuge to get a plate number if it’s so wholesome and patriotic?